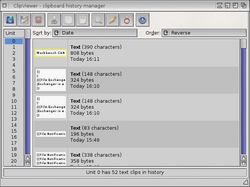 ClipViewer is a clipboard manager for AmigaOS 3 and 4. It is part of the Enhancer Software package for AmigaOS. Some programs such as MultiViewer and MultiEdit have direct ClipViewer support: simply select the Open ClipViewer.. option in the Edit menu. To search for a text phrase in the clips list, you will then need to click the Search the history icon in the toolbar. Underneath the toolbar a Pattern text box will appear where you can enter your search phrase. If the latter option is not selected, only the current unit will be searched. ClipViewer requires the Shared Image Class to be installed in the Images sub directory of the Classes drawer. 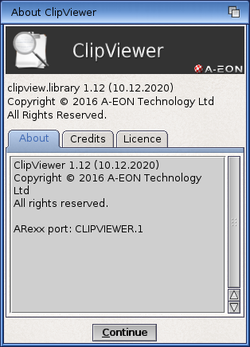 ClipViewer also uses the InfoWindow Class if installed in Classes drawer. This page was last modified on 2 May 2016, at 13:31. This page has been accessed 49,187 times.